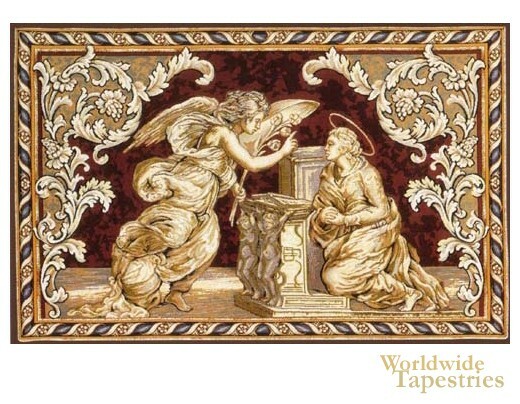 This fine tapestry touches on one of the more familiar religious themes, the Annunciation. Here, the archangel Gabriel visits Mary, the mother of Jesus. It was then that Mary learned she would be giving birth to a child, nine months hence. As such, the Feast of Annunciation is held March 25, exactly nine months before the feast of the Nativity of Jesus, Christmas. Nazareth is thought to be where the Annunciation occurred and a church was later built there to mark the occasion, which is known as the Church of the Annunciation. In “Annunciation II” Gabriel comes to Mary while she is praying. The lovely rendition, which is bordered on all sides with an ornate frame, is highly detailed and exquisitely woven. This tapestry is lined and has a tunnel for easy hanging and display.